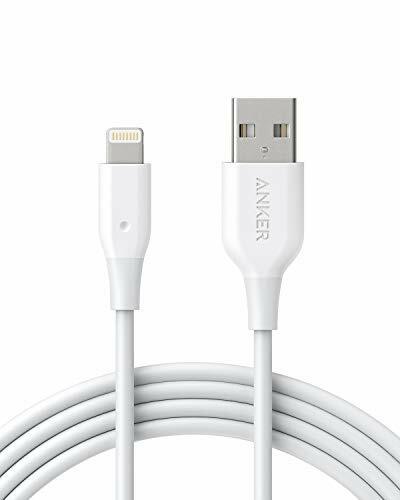 PowerLine Lightning (6ft) The Fastest, Most Durable Lightning Cable From Anker, America's Leading Charging Brand Faster and safer charging with our advanced technology 30 million+ happy users and counting Heavy Duty for Heavy Use We reinforced PowerLine with bulletproof fiber, then bent it over 5, 000 times and observed no damage or change in performance. Faster Charging With wide-diameter wires and reduced cord resistance, PowerLine Lightning delivers the fastest charge any USB charger is capable of. Damage-Resistant Connectors A lengthened unibody design flexes with your cable, ensuring that the connector never gets crushed or detached. Freedom to Move With the 6-foot PowerLine Lightning, you don't have to sit near a power outlet as you charge your device. Instead, you have the flexibility to set up your work environment as you prefer. Apple MFi Certified Each PowerLine cable contains a unique authorization chip of the latest kind issued by Apple to ensure 100% sync and charge compatibility with any Lightning device. This ensures faster speeds than non-certified alternatives. Worry-Free Warranty At Anker, we believe in our products. That's why we back them all with an 18-month warranty and provide friendly, easy-to-reach support. Please Note: This cable is not compatible with Lifeproof iPhone 6 / 6 Plus cases. It will fit Lifeproof cases for other Apple devices as well as the vast majority of cases from other manufacturers.